On behalf of the Board of Management and Staff of Scoil Niocláis, I would like to thank all our parents and particularly, those parents in Scoil Niocláis Parents Association for their help, support, encouragement and cooperation during the term. I also want to convey my gratitude to the all the teachers who participate and organise the sporting, cultural, musical and artistic events in Scoil Niocláis. Happy Christmas and a prosperous 2010 to all. 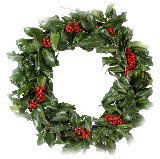 Guim Nollaig faoi sheain is faoi mhaise ar mhuintir Scoil Niocláis agus gach dea-ghui don ath-bhliain. Miss Chawke's 6th class have entered the Discover Cork City Heritage Projectt. 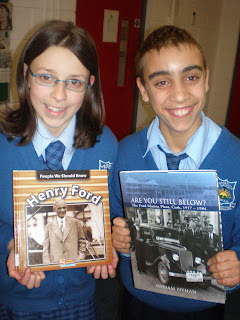 It is organised by Historian and Councillar Kieran McCarthy who visited our class for a project workshop. 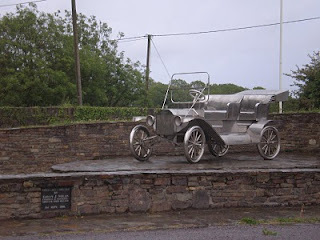 Our chosen topic is the History of Ford in Cork. We chose this because this year was thte 25th anniversary of the closure of the plant on the marine. Our project will be submitted at the end of January. As part of itts complettion we have done field trips, interviews, a poster campaign, 3D construction , library visits and internet research. It truly was a momentous day in the history of our school when our boys finally captured the Sciath na Scol title last November. The team managed by Mr. Moynihan played a fantastic brand of flowing football and a great occasion was matched by a man of the match performance by Patrick Lee. The team were led by a brilliant captain in Liam Dineen and our wonderful supporters cheered us on every step of the way!! A huge thank you and well done to all involved in this wonderful day!!! 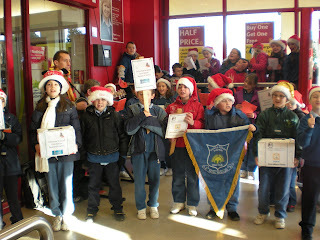 Mr.Walsh's 3rd class and Ms O'Brien's 4th class went carol singing in Ryan's Super Valu in Frankfield and raised over 700 euros for Cork Cancer Research Centre and the Hope Foundation. 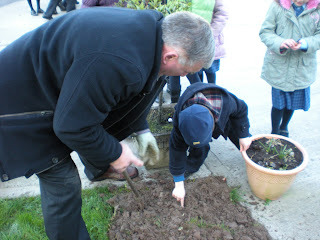 Ms. Holland's 2nd class were busy planting tulip bulbs on the school grounds. A big thank you to Michael our caretaker for all his help. Well done to Ucha and Luka Nadirashvili who made a lovely display on Georgia. They told us all about the country and we even learned a little bit about the Georgian and the Russian languages. Ucha also wrote out the Georgian alphabet for us. Last month, the three 3rd classes visited the Blackrock Observatory and it was really great. Our teacher’s name for the day was Frances. Frances made the inside of a real comet and we made paper comets with straws and ribbons. We played `Comet Chaser’ twice. I learned lots about comets and played a quiz and voted with remote controls. For the real comet we mixed water and dry ice, dirt, salt and ammonia. It was really interesting at Blackrock Observatory. On the eleventh of December, an air of hush could be felt in our classroom. Today was the day – the day when the auditions were being held for the school Xmas Factor. With the excitement building fast, Ms. O’Callaghan asked which acts would be participating – nine in total. Four dance groups, one poem, two singers, one comedy and a partridge in a pear tree! It lasted for about forty minutes – forty minutes of pure talent. First “Saváiste Cabáiste” – a rare combination of music and comedy. Next, Paulina singing “Dancing Queen” – a truly magical performance. Third, Tara – with an enchanting dance to “Sleigh Ride” – a popular Christmas carol. Next “Destiny” – a dance group with a lively performance of “Bad Boys”. Daniel and Peter followed with an amazing performance that blew the house down. With their exemplary Irish dancing they danced to rock music. Truly brilliant! Daniel Cullinane was next singing “Don’t Worry” whilst Kyrin and Alex joined forces to sing a comic version of “Deck the Halls”. The concert concluded with Áine reciting a poem “Things I’d do if it weren’t for Mum” and Robert dancing to “Thriller”. A close vote put Peter and Daniel ahead. We collectively decided that they represented our best hope of winning the Xmas Factor!! Best of luck to all of the finalists participating in the final on Monday! In October, we learned a lot about Anne Frank in our History classes. We were delighted when we heard that the Everyman Palace Theatre was running a competition based on their production of “Anne Frank and Me”. There were different sections to the competition, which included poetry and music. Individually, we wrote list poems, composed a piece of music and hoped for the best! A few weeks later we were delighted to receive a phone call from the organisers of the competition who confirmed that five pupils in our class had won prizes. Ruth O’Halloran and Dara Brady won first and second places in the poetry competition – each receiving a very exclusive leather diary and vouchers. Daniel Cullinane, Cathal O’Sullivan and Amy McEvaddy came first, second and third in the music competition – each receiving a voucher also. As we had so many prize winners in our class we were given an overall class prize of tickets to see the play in the Everyman Palace Theatre. Unfortunately, the performance was cancelled the day went to see it but the Everyman have invited the whole class back in January to see the play. We are really looking forward to this!! The best way to protect the planet is to avoid waste in the first place. This can be done simply by reducing your consumption of energy and of products over Christmas. Below is a list of efficient ways to be environmentally friendly over the Christmas holidays. Take your own bag with you when you go shopping. Don't load up on plastic bags that will end up in landfills. If you have to take a bag with your purchase, save it and use it again. Use last year's Christmas wrapping. Unwrap presents carefully and neatly fold the paper to wrap another gift with later. Personalize last year's Christmas cards. You can cut a Christmas card in half and write a message on the back of the picture to use it as a Christmas post card. Buy gifts with rechargeable batteries. It's always better to reuse a battery than throw it out. Donate old Christmas gifts to charity. Use your Christmas tree as a shelter for birds and animals. You can also use the tree as mulch or wood chips. Make donations. Have a party. Do something nice for someone else. Avoid packaging! Buy gifts that are made of recycled materials and are packaged in recycled packaging. Raw fruit and vegetables, egg shells, pencil parings and tissue are all compostable and create fertile compost for your garden. Plants, trees and seeds are great gifts that will contribute to the quality of the air around you. When you're going to bed, during the day be sure to turn off your Christmas lights to save energy and money. Scoil Nioclais was also visited by a World War II battle group this term. We saw military vehilcles including jeeps and motorbikes with sidecars. There were soldiers dressed in German and Allied uniforms. There were weapons of all shapes and sizes on display. 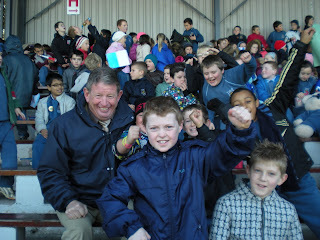 Bengt from Germany told us about what it was like to be an eight year old boy during the war. It was a fascinating story. Yesterday was an exiting day. A group of people came with items from World War II and we went down to the hall at 11.15. First we found a place to sit. The guide started talking about the guns. The machine gun was first. You could not come out of the sky with the machine gun. The bazooka was next. It is 90 centimetres long, it was not heavy at all. After that was the uniform. The jacket was very light because if they fell in mud or water they would not be carrying it. They had a first aid kit, a parachute, cutlery, a gas mask and food. There were more items. Then Ben told us his story. That was good. By Daniel O Connell 4th class. A World War 2 museum came to our school hall on the 29 of September .A group of people showed us what a soldiers life in World War was like. They brought a motor bike and an army truck. They also showed us German and American uniforms. A soldier had a first aid kit, shoe laces, and water bottles. He carried food, cutlery, a shovel, soap and a shaving brush. An interesting fact I didn’t know was that one gun called a Bazooka fired a flame at the back of it. Ben told us about being a child in the War. But it was upsetting to hear his father died. The World War 2 museum was very interesting and I would love to see it again. This Term Scoil Nioclais had an exhibition on the Romans. 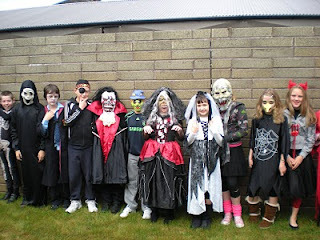 Pupils dressed up and examined the types of food, fashion, hobbies and homes that they had. We were delighted to receive a visit from the Lord Mayor this year. 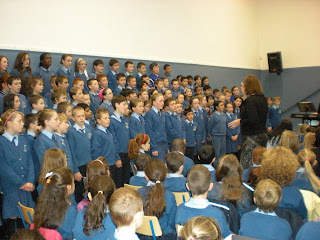 The fifth and sixth class choir also gave a lovely performance. Well done! Pupils in Scoil Nioclais were delighted to receive a visit from the Douglas Hurling Team who won the Premier Intermediate Championship this year. Well done to our boy’s athletics team who retained the county championship for the third year in a row. A fantastic overall team display was capped off by Adam Idah winning his first individual county championship. 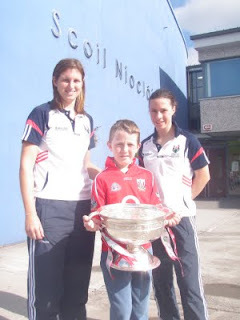 Camogie Champions Call To Scoil Nioclais! Victorious Camogie Captain Amanda O'Regan along with full back Catríona Foley recieved a rousing reception when they visited Scoil Niocláis with the O'Duffy cup last week. The camogie stars met the children and stressed the benifits of playing sport and emphasised the fun part of participation in sports. Picture: Amanda O' Regan, John O' Sullivan and Catríona Foley. 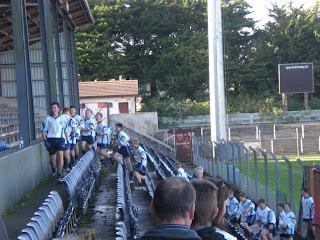 Both boy’s and girl’s football teams have returned to action in the past few weeks in Sciath na Scol action. The boys have recorded three fine victories in their first three matches, playing a lovely style of football, under the watchful eyes of the management team Mr Moynihan and Mr O Donovan. The girls have won one game and lost one and are doing really well under the guidance of Ms Creedon and Ms Ruane. Well done to all involved and keep up the good work. Scoil Niocláis Abú !!! 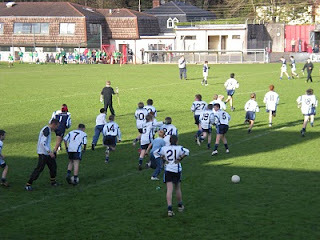 The delayed Cork School Sports will take place in Pairc Uí Chaoimh on Wednesday 30th. The boys will run first in the morning with the girls having their turn in the afternoon. Hopes are high for another successful day and a three in a row for Scoil Niocláis with both teams having won their divisions for the last two years. A special word of good luck to Eli Kadi Harrington as he bids to win an unbelieveable 6 county titles in a row. The Cork School Sports has been postponed because Mr O'Donovan wants to play Kerry on Saturday and he doesn't want the pitch to be wrecked!!! The replay of the Munster football semi final takes place in Pairc Uí Chaoimh on Saturday so the Cork School Sports is off until next Wednesday 17th. Thanks a lot Mr O'Donovan!!!! - Oh and good luck on Saturday! Well Done to the Scoil Nioclais Camogie Team! Well done to our Sciath na Scol Camogie team who represented the school so proudly in Pairc Ui Caoimh last week. The girls displayed fantastic skill and teamwork to get to the final and played really well in their first trip to Cork GAA HQ. We are really proud of all the girls and their coaches. Thank you and well done to all involved!! 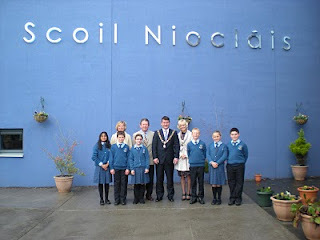 Welcome to the Scoil Nioclais School Blog Pilot, which is a feasibility test of blogging (web logging). A select group of teachers are testing how this allows easier and more frequent publication of individual stories, highlighting day to day activities in the classroom. It also allows publishing of multimedia, including text, pictures and video. We look forward to seeing how this progresses.